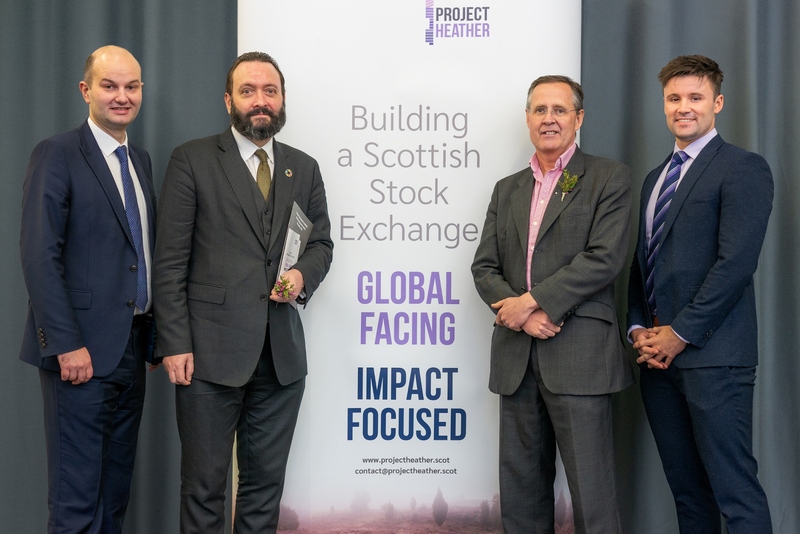 Anderson Anderson & Brown LLP (AAB), one of the UK’s leading firms of Chartered Accountants & Business Advisors, has secured a significant seven figure equity investment for Project Heather to support the re-launch of the Scottish Stock Exchange after almost fifty years. From left; AAB’s Douglas Martin, Tomas Carruthers and Edwin Hamilton of Project Heather and Stuart Cooper of AAB. In late 2018, Project Heather agreed a partnership with one of the world’s largest stock exchange platforms, Euronext, to run the exchange on its Optiq trading platform. Following FCA approval, Project Heather plans to launch before the end of 2019 having already received significant national and international interest from businesses considering a listing on the exchange. Brian McMurray and Stuart Cooper of AAB worked with Tomas and the Project Heather team in delivering fundraising advice, sourcing investors and ultimately securing the desired investment. A further institutional investment round is expected to kick off in the coming months and interested parties should contact the team at AAB for more information.